Dont forget about our weekly Friday BBQ tomorrow! Adults are $20 and kids under 12 are $10, plus taxes and gratuity. There is no need for a reservation, just come down to the club after 5:30 and ask one of our friendy bar staff to sign up! Detailed sailing instructions will be available soon. To reserve your food tickets contact James by e-mail at bar@kingstonyachtclub.ca or by phone at (613) 548-3052 ext. 206. The Annual KYC Sailpast and Review of the Fleet by Commodore Rosemary Wilson marks the official opening of the Club for the season. BBQ will commence after the Sailpast. The Commodore will Review the Fleet from Kibitka, which will be located about ¼-mile south of the KYC Flag Staff. Participants should assemble on the water at 1500hrs, in the vicinity of the Orange Peel. (Typically the Orange Peel will set up approximately ½-mile upwind of the Commodore. In the case of a north wind, the Orange Peel may set up abeam of the Commodore, to the west). For details, participants should monitor VHF Ch.71 or come within hail of the Orange Peel. The order of sail will be in-line, from the smallest to the largest, power and sail intermixed. Celebration ashore: After sailing-past, return to your mooring or tie up at the KYC Guest Dock and “dress ship”. Ritalin - Cutest crew under 2! Seattle Slewp - Closest "Fly By"
The Food & Beverage Fair is on Saturday June 20th and will feature new food ideas from Chef Neil's kitchen and wine and beer sampling from KYC's suppliers. This is a great chance to find out about what we have in store for the club this summer or introduced new people to KYC. Members are $20 and non-members are $25. Please e-mail James at bar@kingstonyachtclub.ca to reserve. This week our feature draft tap is Muskoka Brewery's Summerweiss, a delicous Bavarian style wheat beer. 2015 Member Cards are Here! Pick up yours at the main office, or at the bar after office hours. Car stickers are in on June 6th! 2015 Community Club Membership Now Included in Family and Single Memberships! We are pleased to announce that Community Club (CC) Membership is now included for Single and Family members. As in the past, any Single or Family member is eligible to apply for CC membership to have access to KYC's Shark Fleet. New CC applicants will complete an orientation session, and a sail test as required, before being granted access to the reservation system and the fleet. This is a great opportunity for members who do not own a keel boat and those with larger boats who may occasionally want to sail on a Shark. Please contact Brett Thompson (office@kingstonyachtclub.ca) if you are interested in joining the program or have any questions. On the evening of October 31st 1780 - Halloween! - the 22-gun British man-of-war Ontario was struck by a ferocious line squall and sank with all her 130 men. It remains the worst shipwreck in the lake's history. She was discovered on May 24th 2008 by Dan Scoville and Jim Kennard, using an adaptation of the sonar technology invented to find U-boats. Come and hear Jim Kennard himself tell the whole story, his presentation illustrated by astonishing video footage! Free admission for Marine Museum members. Not a member? $20 admission to the event includes a one-year membership! RSVP to the Marine Museum at 613-542-2261 to reserve a seat. Able Sail is looking for volunteers! We need people to help with boat maintenance, and to act as sailing companions (especially on the new Sonar). We plan to have the boats on site by next week, so the last week of May is a crucial time for getting the boats in shape for the summer. If you would like to be a sailing companion, there will be a volunteer training session at KYC at 5 pm on 10 June, to cover the basics of accessible sailing. This is also a great volunteer opportunity for highschool students looking for a fun way to get their volunteer hours. 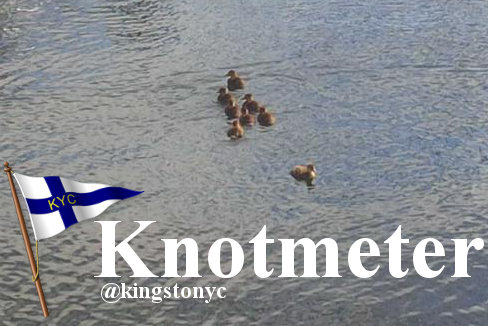 Kingston Squadron has a seminar scheduled Tues evenings 2 & 9 Jun 6:30 PM to 9:30 PM at Ongwanda, 191 Portsmouth Ave. The $80 seminar includes the Boating Basics textbook with self-check questions. First evening the instructor covers many of the topics. Second evening is the one hour 50 question Transport Canada multiple choice test. A temporary PCOC is issued and a wallet card is mailed to the graduate.